Moschino Forever Sailing brings to its owner dreams of the sea on long voyages. Moschino Forever Sailing 100ml. Eau De Toilette is a new fragrance, released in 2013. Male bouquet represents the family tree fern compositions. Mediterranean flavor dedicated and represents young, active men who love sports and adventure. refreshing and sparkling, it gives the sea breeze and the rustling of the warm sand and stunning sunsets over the boundless sea. New flanker became famous perfume Forever. 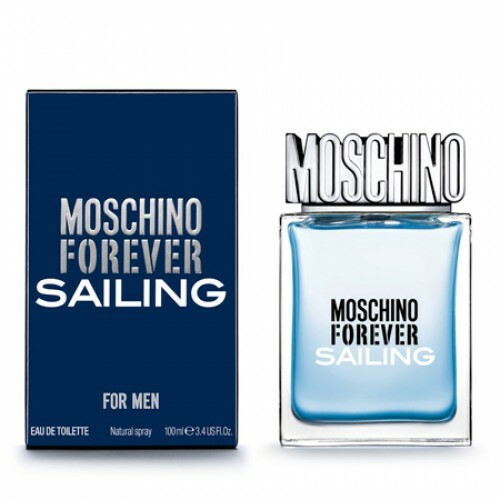 Moschino Forever Sailing - this expressive combination of notes of sparkling lemon, ripe grapefruit and mint ice surrounded by lavender and juniper, rich patchouli, musk, amber and warming soft woody notes. Date flavor: fruity floral Top notes : mint, citrus and grapefruit note "Hearts": mint and juniper Final note: musk, amber. new perfume for men in 2013. Belongs to the family tree, fern groups compositions. Fashionable, attractive and seductive bouquet is perfect for young and active men. Perfume unobtrusive and refreshing, perfect for a hot summer, it is like a breath of fresh air in a hot megapolis. Aroma Forever Sailing begins its sound with cool notes of mint, grapefruit and lemon. The notes of the heart felt aromas of juniper and lavender. At the end of the composition harmoniously interwoven motifs amber, woody notes, patchouli and musk. Moschino Forever Sailing, inspired by the long voyage, the smell of the sea and adventure. "Compared with other flavors new Moschino Forever Sailing is aimed at a younger audience, for those who love sports and the sea," - said the president Euroitalia, Giovanni Sgariboldi. The new fragrance Moschino Forever Sailing - this delectable combination of citrus, icy mint and aromatic nuances on the basis of wood. The composition opens refreshing notes of frozen mint, lemon and grapefruit. Union built around the heart of lavender and juniper and base includes patchouli, musk and sensual amber-woody accords. Forever Sailing dressed in a bottle of the same shape as its predecessor in 2011. The odor itself, this time painted in celadon.